The wind blows one way but the windmill turns another. To a group of fifth Columnists, it's a signal. It also signals to an intrepid American reporter that he's stumbled across the biggest story in prewar Europe. 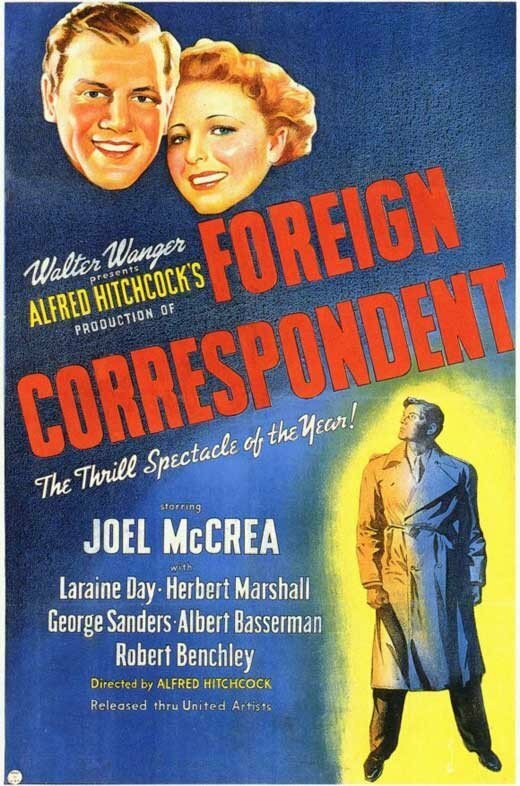 Foreign Correspondent is prime Alfred Hitchcock, a showcase of the director's best cinematic tricks and executed on a grand scale. An 80-foot windmill, a 10-acre facsimile of Amsterdam Square used to stage a stunning rain-soaked assassination scene and an airship with a 120-foot wingspan for a still-amazing sea-crash sequence are some of the massive sets in this gripping spy yarn. Joel McCrea, Laraine Day, Herbert Marshall, George Sanders and Robert Benchley headline this nominee for six 1940 Academy Awards, including Best Pictures.